When the Hummer H1 ended production in 2006 we found a big blocky hole in our heart that the H2 and H3 couldn’t fill. The Hummer H1 was no perfect vehicle, but it had its merits and there was nothing else out there like it. Well, now thanks to Mil-Spec Automotive (MSA), you can have your very own specially built H1. Meet the Launch Edition H1. It's one of the most rugged and ready-for-anything SUVs you can buy. The Mil-Spec Automotive H1 looks ready for action from any angle. Mil-Spec Automotive is based in Wichita, Kansas, and its new vehicle is based on the original AM General Hummer H1. The company’s mission was to take all of the good parts of the original vehicle and none of the bad. Adam Mitchell, CEO of MSA, told Car Buzz that his company spent two years researching, designing, and developing different prototypes before his team came to this specific design. The 12-person team starts with an original donor, which is them stripped down to the frame. From there, the guys at MSA go to work, turning the model into the beauty you see in the photos. If we saw this in our rearview mirror, we'd get out of the way. The model gets an aerospace-grade aluminum body, ceramic underbody and engine bay coating, and a unique body coating with texture. It also receives heavy-duty front and rear bumpers, alloy wheels with off-road tires, and exterior LED lighting. Inside the cabin of the Launch Edition H1, the model gets luxury materials and amenities, including a premium JL audio system, interior LED lighting, backup camera, dual USB charging ports in the front and rear of the vehicle, a GPS gauge cluster, brushed stainless steel pedals, more aerospace-grade aluminum, marine-grade hand-stitched leather, and custom seats. Under the model’s large, flat hood lurks a Duramax 6.6-liter turbodiesel V8 that makes 500 hp and an insane 1,000 lb-ft of torque. This power plant connects to an Allison 1000 six-speed automatic transmission. The model also gets four-wheel, independent suspension. The suspension comes equipped with heavy-duty half shafts and fixed mounted differentials. To complete the build, MSA adds 3.5-inch thermal-coated performance exhaust tips. The details of the Mil-Spec Automotive Launch Edition H1 are what's so special. In the four-door configuration, you can get a pickup version or a slant-back version. If you only want two-doors, you have to get an extended-bed hardtop pickup truck. All this doesn’t come cheap. Not including the donor H1, you’re looking at paying at least $218,499. 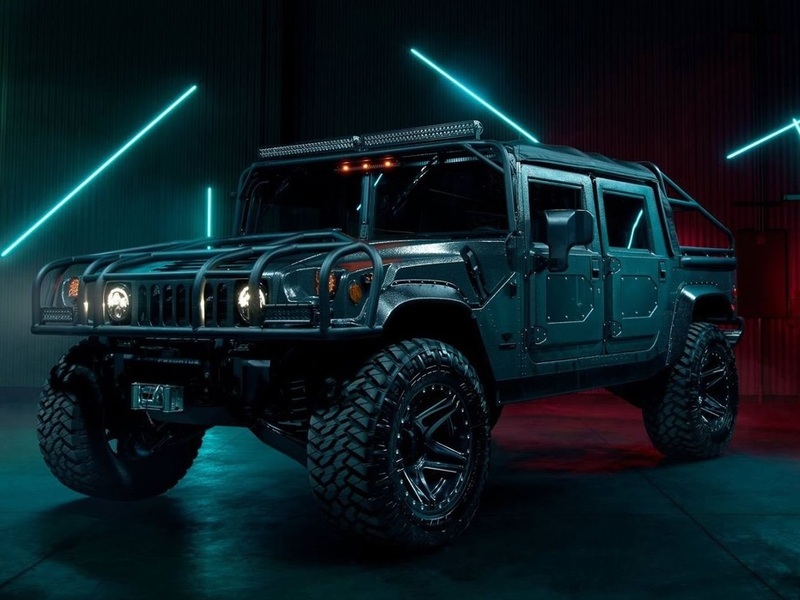 You better start saving up for your apocalypse-ready Hummer today.